Los Angeles, CA. September 27, 2018 —What began with a literal groundbreaking ceremony in May of 2017 is now a conceptually groundbreaking homelessness program as The Salvation Army dedicated its new Donald & Priscilla Hunt Apartments at Bell Oasis on Thursday afternoon. Responding to the growing homelessness crisis in Los Angeles County, The Salvation Army, along with many individual, governmental and foundational supporters, have created 64 affordable permanent housing units ready for occupation in the city of Bell. Enterprise Partners, US Bank, the Donald & Priscilla Hunt Family and Home Depot Foundation are just a few of the committed supporters who have brought this new hope for a better future to fruition. 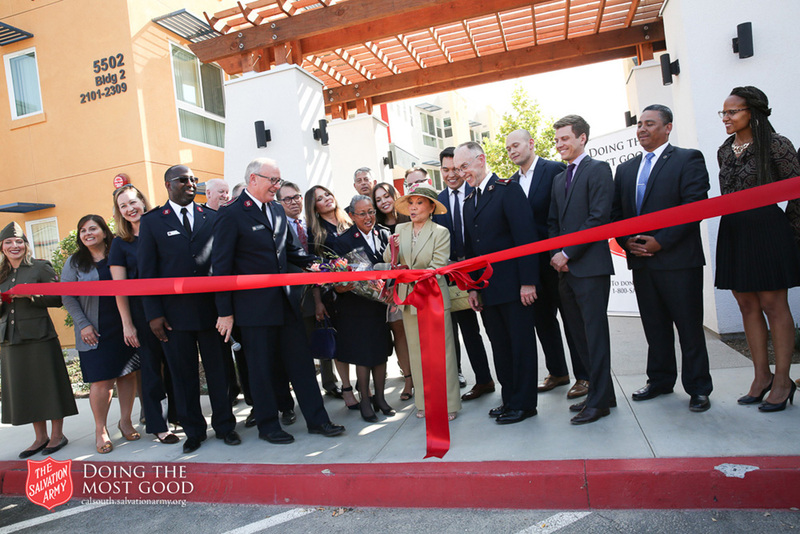 On Thursday, The Salvation Army and its supporters dedicated the apartment complex with a ceremony featuring speakers, a ribbon cutting, and tours of the facility led by new tenants of the building. Located on the campus of The Salvation Army’s Bell Shelter - one of the largest traditional homeless shelters west of the Mississippi - the Donald & Priscilla Hunt Apartments will provide 64 formerly homeless individuals, many of them veterans, a lasting and nurturing place to live. The apartments have an on-site health clinic, employment services, an exercise room, gym, and a community center. This is NOT a homeless shelter…It is a place where residents who may have experienced homelessness, now have a place of their own - a place where they will access on-site case management and supportive services through referrals and partnerships with other organizations thus maintaining their civic equilibrium and dignity.